The first step is to become a Friend. This allows us to keep the gardens going and to build our register of helpers and supporters. Becoming a Friend is also the first step towards getting a plot of your own – although many Friends also elect not to have plots. When you complete your registration form, you should tell us whether you would like to go on the waiting list for a plot of your own. Preference for plots is given to those who have become involved, demonstrated their enthusiasm and helped out or contributed in some way. 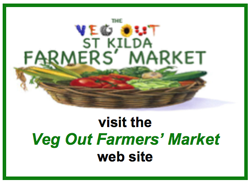 Download the Friends of Veg Out registration form for printing and mailing (Acrobat PDF format). Becoming a Friend costs $15 ($10 concession). While you’re on the waiting list, if your contact details change you should let us know so that we can contact you. All plotholders must live in the City of Port Phillip local government area, and must sign the Veg Out Vows. The Vows ask that several important tenets of the gardens be upheld. We’re always looking for extra help. Working Bees are held on the first Sunday of every month, and they’re lots of fun and a great way to get involved and meet other workers. There is always plenty to do – see whoever’s in charge, and they’ll help you to find a task. And lunch is served to all workers. Even if it’s not a Working Bee Sunday, Sundays in general are busy, so just come on down. When will I get a plot? There is great demand for garden plots, and as a result there’s a waiting list. To ensure you have the best chance, come down and get involved! Joining in on Working Bees (held on the first Sunday of the month, except in January) is the best way to contribute and show your enthusiasm. Preference for plots will be given to those who help out and contribute.